Brief Synopsis – Billy the Kid and his friends are back in the sequel featuring some of Hollywood’s best young actors. 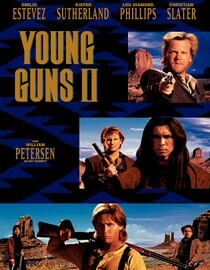 My Take on it – In this sequel to Young Guns (1988), Emelio Estevz and his crew of young Hollywood heartthrobs (Kiefer Sutherland, Lou Diamond Phillips, Cristian Slater, William Peterson, Alan Ruck, Bathazar Getty and Viggo Mortensen) once again give a modern spin to the western. This time is less fun than the original and the plot and storyline is much weaker. I have written previously about the summer of sequels in 1990 and this movie seems to have been made for the sole purpose of making money on the concept and they forgot to add a coherent plot along the way. I find this quite unfortunate since they had the potential to make a sequel with a better storyline. The stories of Billy the Kid could have been used in a more prolific way giving us a more accurate account of his further adventures. Kiefer Sutherland wanted out of this movie so bad, he had the writers kill off his character who in real life lived for 50 more years or so. That, in and of itself proves that even the actors had a hard time making the movie.